It’s a day of boozing, camaraderie, cliches, the color green and, especially, good fortune. So here’s 10 things to keep you busy on Tuesday. 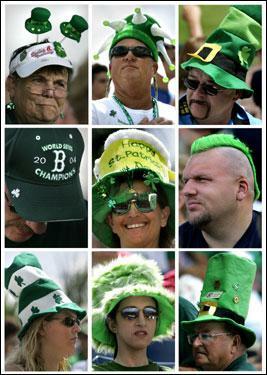 10) Find the craziest, greenest headgear you can find. If you can’t find an appropriate hat, shave your head and dye your scalp green. 8) Swim in a green river. I recommend sticking to dyed bodies of water like the Chicago River, rather than rivers that are (un)naturally green. 7) Drink a Shamrock Shake at McDonalds. As these have mainly been phased out in most locations, you’ll have to travel to Ireland to be sure of finding a McD’s that serves them. 6) Beat up a snake. St. Patrick would be proud of you. 5) Eat some Irish stew. You’ll need something to line your stomach for all the mandatory boozing. 4) Drink green beer. Again, try to find beer that is green because it’s been dyed. 3) Take in a parade. Specifically, a St. Patrick’s day parade. If you find yourself drunk on Guinness at the Macy’s Thanksgiving Day parade, go immediately to bed. 2) Gamble. The Irish are considered lucky, and St. Patrick’s day is their big blowout. Some of that luck is bound to rub off on you, especially if you own a lucky leprechaun’s foot. Try your luck at our online casino. 1) Buy Shane MacGowan a drink. But whatever you do, stay away from his teeth.